I recently traveled to Dallas, Texas to honor Vlad Guerrero for being inducted into Baseball Hall of Fame. The Texas Rangers decided to pay tribute to Vlad’s induction with a bobble head giveaway, a special pregame ceremony and a luncheon. I attended the Hall of Fame Luncheon hoping to see a current player or two along with a few guys that played during Vlad’s time in baseball. Hall of Fame catcher Pudge Rodriguez had been promoted as an attendee. Two Hall of Fame players at the same luncheon on a Friday afternoon in Arlington. What could be better than that? I didn’t expect that a 97-year-old in the room would trump them all. 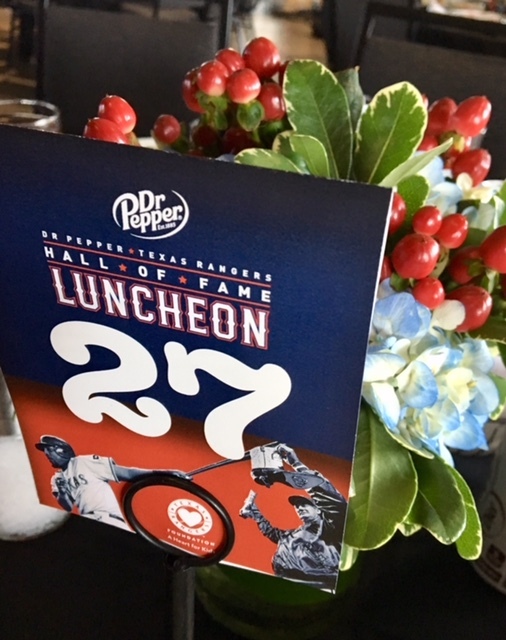 The Rangers official title of the luncheon was the Hall of Fame luncheon honoring the 2018 National Baseball Hall of Fame Inductee Vladimir Guerrero and the legacy of Ted Williams. I missed the last line about Ted Williams. Ted Williams played before my time. His numbers are simply insane and he is considered to be one of the best hitters to ever played the game but I never saw him play. I didn’t know they were going to talk about Ted Williams or have players that played with him or for him at this luncheon. To start the luncheon they brought a few gentleman on stage to do a Q&A in regards to Ted Williams who was the Texas Rangers Manager from 1969 – 1972. They announced the panel and one name, Eddie Robinson stands out. I thought I recognized the name but I think maybe I’m confusing him with Brooks Robinson. Quickly grabbing my phone and googling Eddie Robinson only to be stunned by the text I’m reading. Let me begin with the year he was born, 1920 in Paris, Texas. This guy is 97 years old and just walked onto the stage by himself. Amazing stuff but wait a second. 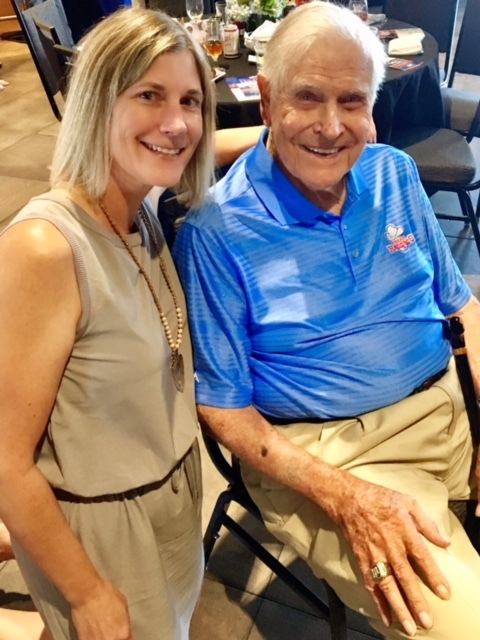 Reading along reveals he had a 13 year playing career playing first base, was a four-time All Star and a member of the Cleveland Indians who won the 1948 World Series. He has been a player, a scout and a front office executive in five different decades. He was on the rosters of seven of the eight American League teams then in existence. And that’s not all, there’s more. How can there be more? This is a full 50 years of baseball in one person. The further I read the more interesting it gets. Now for my favorite part of his Wikipedia page. This is the part that gave me goosebumps as was reading it. Courtesy of Wikipedia- Robinson is the last living person to win the World Series with the Cleveland Indians, as well as the oldest living player to play on a World Series-winning team and the oldest living member of the Detroit Tigers, New York Yankees, and Washington Senators. I am stunned and quickly nudge my friend Jeanine to have her read it as well. I think I needed confirmation that what I was reading was real. How did I not know he was going to be here and how do I not know who Eddie Robinson is? Once the luncheon ended I was hoping that I would be able to just shake his hand. I lucked out. This incredibly kind gentleman signed my ticket with beautiful cursive handwriting that you rarely see anymore. It immediately reminded me of my granddad’s handwriting. He also was gracious enough to allow me to take a photo with him. Mr. Robinson is a large guy in stature. In his late nineties he still looks 6 ft tall and has a presence. I noticed he had large hands and long fingers. He would have been a great target at first base for his infielders. It sounds corny but he still had a twinkle in his eyes. It was like they were smiling and still so full of life. He is the past living in the present. One of the few still on this earth that knows how the sport of baseball was back 60+ years ago. He knows what former players were like. Which guys were the teammates you wanted to play with, who was the funniest, and who the rule breakers were. He has seen so much change not only in the game of baseball but on this earth. Imagine being born in 1920 in a small town in East Texas and going to play in cities like New York, Philadelphia, and Cleveland. Meeting him was a wonderful surprise and the highlight of my day. He made it easy to forget about the two Hall of Fame players in the room. I felt incredibly lucky and grateful to have met Mr. Robinson. Life is always full of surprises, remember to expect the unexpected. Holy smokes that is awesome! I remember Eddie being introduced on TV during the 2016 World Series at a game in Cleveland as the last living member of the 1948 Indians team. Incredible that he is still active like this at his age! Great stuff. Thanks Scott!! Yes he is one amazing man!! !